Last week John Nash, the Nobel Prize-winning mathematician, and subject of the blockbuster film A Beautiful Mind, passed away at the age of 86. He died in a taxi cab accident in New Jersey. Days later, Cliff Pickover highlighted a curious factoid: When Nash wrote his Ph.D. thesis in 1950, "Non Cooperative Games" at Princeton University, the dissertation (you can read it online here) was brief. It ran only 26 pages. And more particularly, it was light on citations. 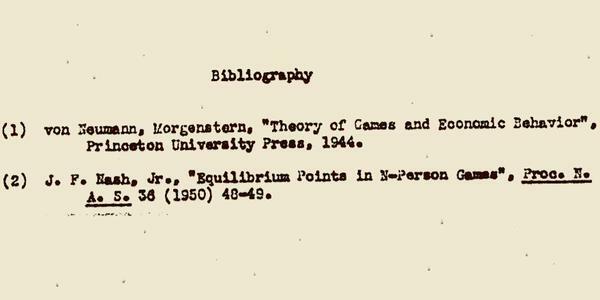 Nash's diss cited two texts: One was written by John von Neumann & Oskar Morgenstern, whose book, Theory of Games and Economic Behavior (1944), essentially created game theory and revolutionized the field of economics; the other cited text, "Equilibrium Points in n-Person Games," was an article written by Nash himself. And it laid the foundation for his dissertation, another seminal work in the development of game theory, for which Nash won the Nobel Prize in Economic Sciences in 1994. The reward of inventing a new field, I guess, is having a slim bibliography.